These last five months were hard. Very hard for him and the ones he left behind. But also precious as we’ve talked about anything and everything. He arranged his memorial service from start to finish, which guests to invite, music, coffin. No flowers but everyone present was invited to place a pebble on the coffin (Jewish tradition). It was a sad but meaningful service, knowing he put his heart and soul into it. “You are allowed to cry”, he said, “but don’t mourn for too long. I’ve lived my life to the fullest, highs and lows, no regrets”. 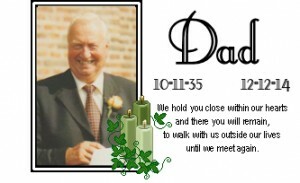 We miss you Dad, you have no idea how much. . .
Keeping your family in my prayers..so sorry for your loss.